Although the First World War did not officially end until the signing of the Treaty of Versailles on June 28, 1919, combat between the Allied nations and Germany ended on November 11, 1918, when an armistice was called for the eleventh hour of the eleventh day of the eleventh month. For this reason, President Woodrow Wilson declared that the nation would commemorate Armistice Day on November 11, 1919 so that, "To us in America, the reflections of Armistice Day will be filled with solemn pride in the heroism of those who died in the country’s service and with gratitude for the victory, both because of the thing from which it has freed us and because of the opportunity it has given America to show her sympathy with peace and justice in the councils of the nations…"
Armistice Day became a federal legal holiday in 1938, and was renamed Veterans Day in 1954 in recognition of the persons who had served in the Second World War and the Korean War. As called for in the Uniform Holiday Bill of 1968, the date of Veterans day was changed beginning in 1971 to allow federal employees a three-day weekend. Veterans were outraged, believing that the November 11 date was meaningful, and Congress moved it back to November 11 beginning in 1978. More information about Veterans Day can be found at the U.S. Department of Veterans Affairs. The United Community Services Central Files document the veterans services offered by UCS and other local organizations in metropolitan Detroit. Covering his time representing Michigan in the U.S. Senate from 1954 to 1966, the Patrick Vincent McNamara Papers include records from the Senate Veteran Affairs committee. Locally, the papers of Detroit Mayor Jerome Cavanagh include records on veterans and license hearings. The WSU Detroit Board of Education / Detroit Public Schools Records include the “Military Records of Detroit Schoolmen, 1900-1953,” an incomplete listing of the service histories Detroit Schools personnel. 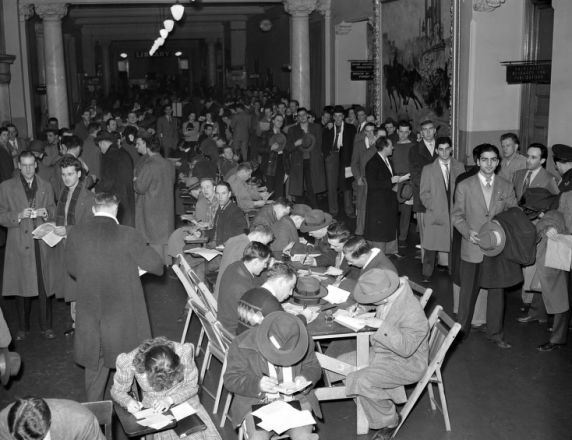 Following the Second World War, large number of veterans pursued a higher education, as can be seen in the image above of veterans registering for classes at what was then called Wayne University. WSU's work with veterans can be documented in the WSU Office of the President: David D. Henry Records, the WSU Admissions, Records, and Registration Offices Reports, WSU Admissions, Records, and Registration: Director's Office Records, and in the university’s newspapers and publications. The Virtual Motor City includes numerous images of Armistice Day celebrations and Veterans Day parades in Detroit, servicemen of the Civil War through the conflict in Vietnam, the building and dedication of veterans' hospitals and memorials, and more. Search the VMC for images from specific events, or view image of Armistice Day and U.S. veterans spanning nearly 100 years. Troy Eller is the Archivist for the Society of Women Engineers.